Travelers are voting Lake Shirwa and Lake Amaramba as the best lakes in Mozambique. Want more? 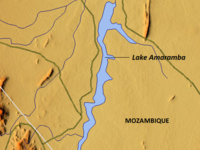 Check out our map of lakes in Mozambique. Lake Shirwa is a lake located in Mozambique. It was discovered in 1859 by the Scottish explorer, David Livingstone.